Whilst travelling in South East Asia, you don’t need to use your brain: restaurant menus are in English and every guesthouse will book a bus ticket for you, so you don’t even need to attempt to buy your own tickets. I find myself turning into a Travel Snob: the kind of person who I usually frown upon, who thinks of themselves as more authentic than other travellers (“I’ve hitchhiked through Iraq, don’t you know?!”). Because of this, I decide to get off of the backpacker trail, say goodbye to the Same Same T-shirts and hopefully leave my conceitedness behind. 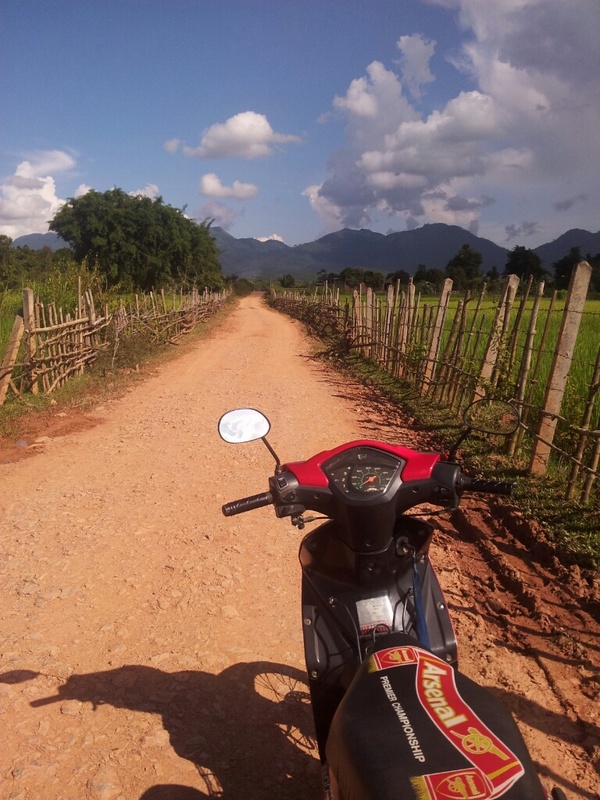 And so that’s how I find myself hitchhiking somewhere in the mountains between Luang Prabang and Phonsavan. Northern Laos is full of expensive SUV cars and none of them stop for hitchhikers. Eventually, one posh car does stop, but the friendly family can only take me 30km. “Expect to cover only as much as you can walk in a day.” These words from Hitchwiki repeat in my head as drivers wave at me and zoom past. I walk through village after village in the mountains. Locals shout to each other, “Falang!” (“foreigner”) and wonder why I’m not on a bus like every other sane tourist. After the fourth village of everyone staring at me, I begin to miss the company of backpackers, who had disgusted me only a few hours before! Finally, a bus does come, and I admit defeat and jump on it. Although I find this amusing, it’s a sad reminder of the kind of tourists who travel to South East Asia. Everyone in Laos starts their day at 6am and goes to bed at 9pm, so it’s not surprising that someone’s hammering nails into the wall of the guesthouse at 7.30am the next morning. Hitching today is more successful. However, I make a very basic hitchhiker’s mistake as I jump into a pickup truck: I don’t ask the driver if he wants money. I show the driver my hitchhiking letter, explaining in Lao language that I am hitchhiking round Asia. This time, for the first time ever, I have written that I can pay a little money. I’m driven for about an hour to a village on my route, and then asked for 20,000 kip. I’m happy to pay this, but I don’t have change. I give him 50,000 kip, expecting money back, but the driver pockets it and refuses to give me money back. In front of his family and friends, I get really upset, and walk away with a feeling of grubbiness that I always feel when discussing money. A few minutes later, another pickup truck stops for me. This time I make it clear, “no money”. They beckon me on, anyway. I whizz through villages in the back of the truck, with scared chickens laying in a basket next to me. The monsoon rain lashes down on us. When I arrive in my destination of Phonsavan, I find a Lao-English speaker and he re-writes my hitchhiking letter, making it clear that I can not pay money! Phonsavan is one of the most heavily bombed places in the world. Having been flattened by US bombing in the 60s and 70s, the city’s now full of new, mansion-like houses. 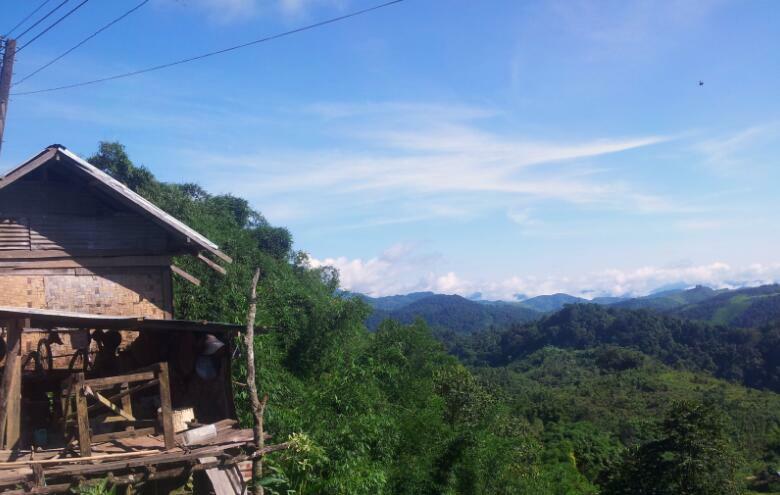 The huge gap between rich and poor in Laos is most obvious here. I’m confused. Is it because of NGOs? Tourism? But then I see an office for a mining company, and it all makes more sense! The next day, I go in search of a scooter to rent. To my dismay, there are no automatic scooters in the whole city. I don’t know how to ride a manual bike, and hiring a tuk tuk would be insanely expensive. “Aaaagggh! I’m going to have a serious accident!” I think as I agree to rent a scooter. The man in the shop gives me a bike with ARSENAL FC printed on the seat, and I take this as a sign that everything’s going to be alright. (A few years ago, I used to be a massive Arsenal fan…which may surprise my more recent friends!). The man from the bike shop worriedly watches me as I yelp with fright and jolt off down the busy main road, barely dodging the traffic. On the road with my Lucky Bike! 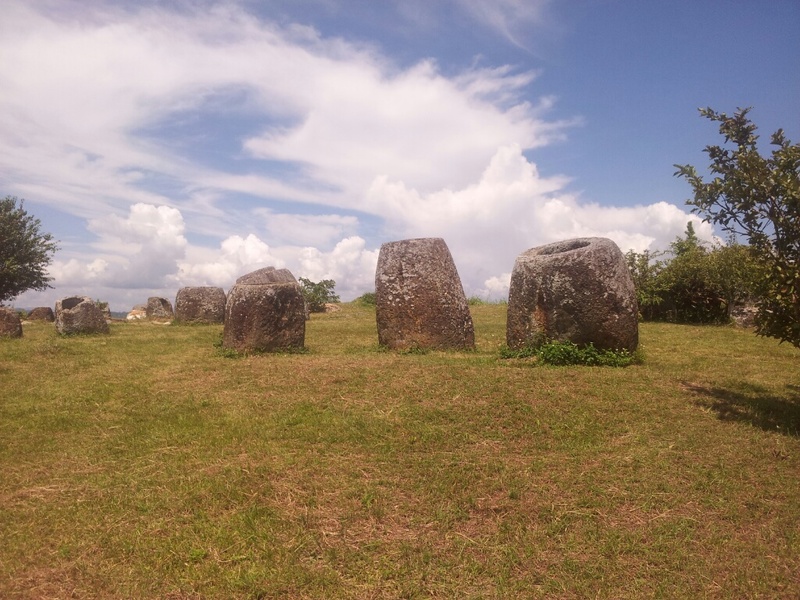 The Plain Of Jars: it’s just like being in Somerset in England! 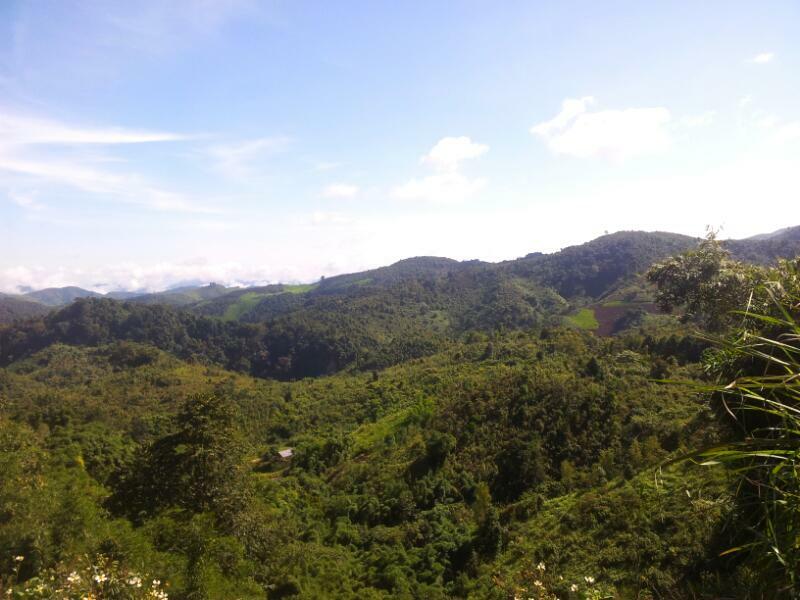 The countryside around Phonsavan is like nowhere else in Laos, with grassy green hills and pine forests. As I explore the famous Plain of Jars, I see clouds of smoke in the distance. I soon find out that I am actually witnessing bomb explosions. 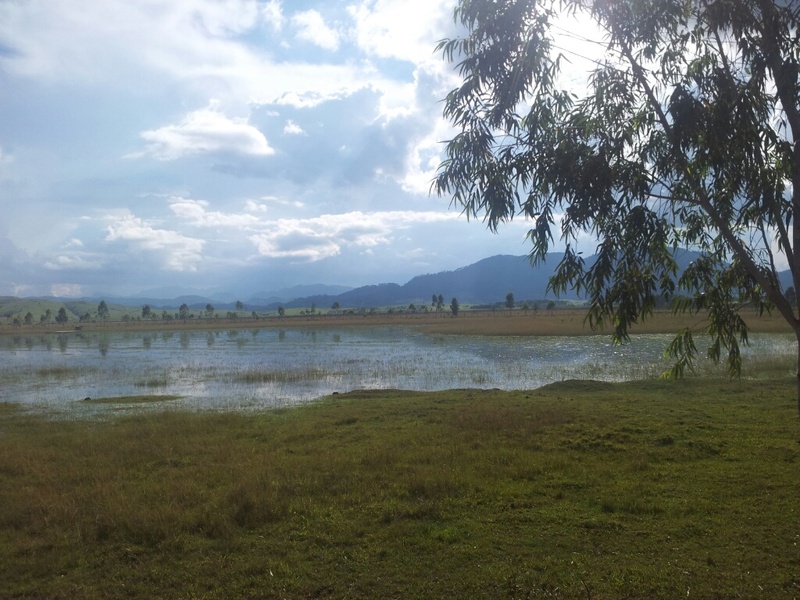 Laos would be the most perfect place in the world to camp, if only it wasn’t littered with unexploded cluster bombs. During the Vietnam war, the US dropped over 2 million tonnes of bombs on Laos, including 270 million cluster bombs. (And the official figure of 2 million tonnes is thought to be a massive underestimate). This was kept secret from both Congress and the US public. 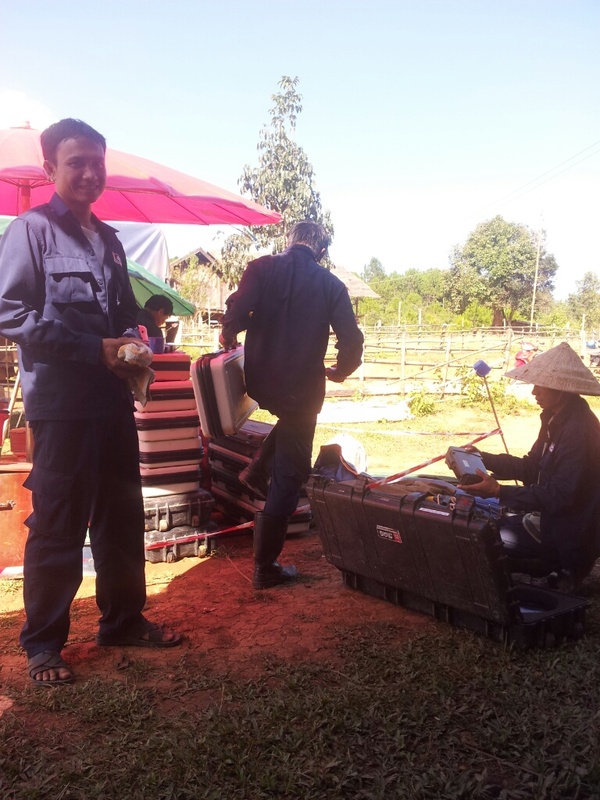 30% of the bombs failed to explode, and now every fourth village in Laos is contaminated with unexploded ordnance (UXOs). There are still 80 million unexploded ordnance in the country. Between 1964 and 1973, Laos was bombed, on average, every 8 minutes, 24 hours a day, for 9 years, making it the most heavily bombed country in the world per capita. 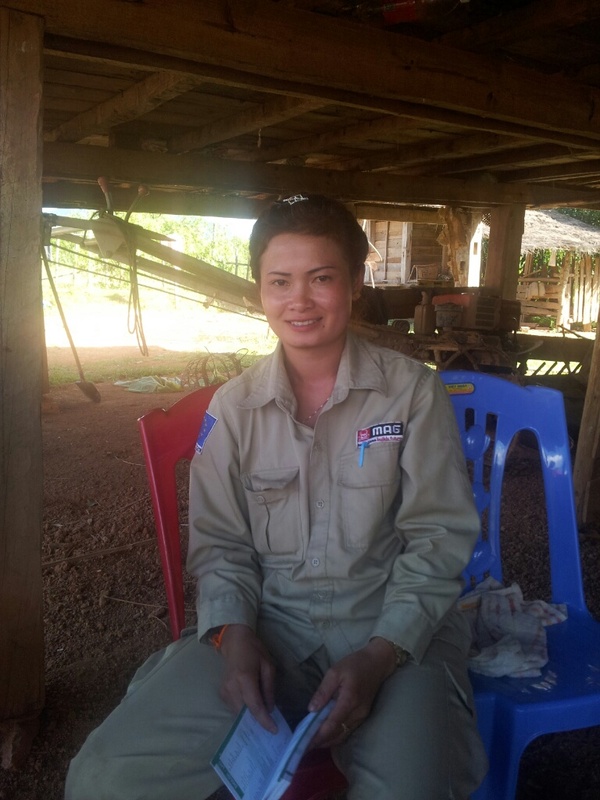 The Mines Advisory Group are working hard in Laos to clear the villages and surrounding countryside of these bombs. About 80% of the ordnance cleared by MAG are cluster bombs. Each cluster bomb contains 670 tennis ball-sized bombies (or bomblets) and each bombie contains 300 metal fragments. 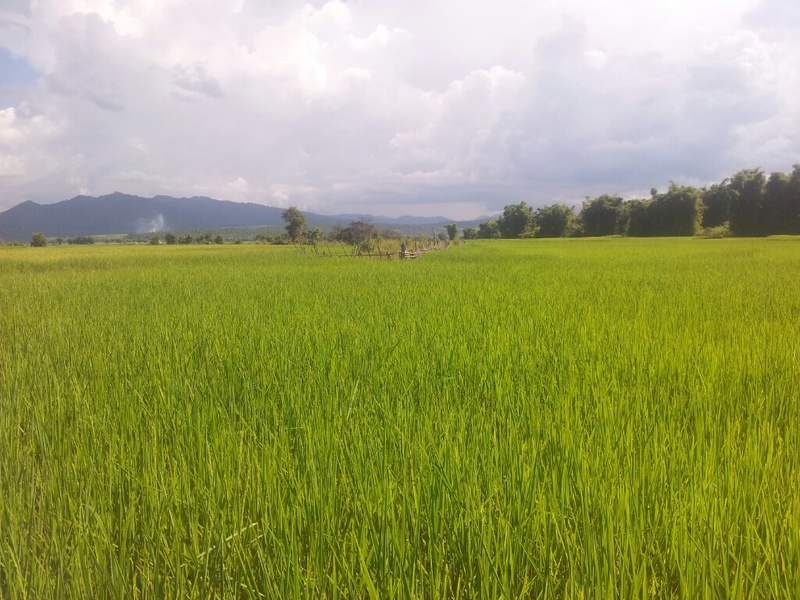 These unexploded bombies are now found all over Laos: in the soil as farmers work in fields, in school playgrounds, under houses. The lives of about 300 people are devastated each year by these bombs. The MAG team destroys, on average, 500 pieces of ordnance per week. 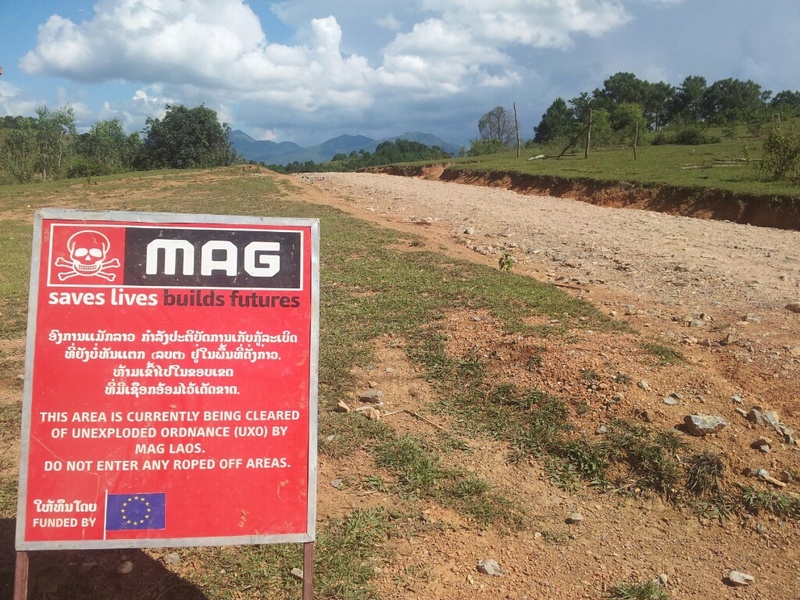 As I explore the countryside on my bike, I am lucky enough to meet a team of MAG bomb clearance women and men. They have just finished their day’s work of carrying out controlled explosions and clearing an area of bombs. I feel so privileged when they invite me to sit with them for a little while. I wish I could speak Lao to tell them how amazing I think they are. The US still continues to use cluster bombs, and it dropped thousands of them on Afghanistan. The US and Britain have brutally used them in Iraq. British companies, such as Brighton’s EDO arms factory, continue to supply equipment which facilitate the release of cluster bombs. Brighton activists have argued in court that EDO is not acting lawfully, as it is illegal in UK law to assist the use of cluster munitions anywhere in the world. Companies have also been exposed selling cluster bombs at the DSEI Arms Fair (the world’s biggest arms fair) in London. And British banks such as Barclays and RBS are well known for investing their money in the arms trade. Activists were in court this week after being arrested for protesting Barclays’ investment in war crimes. 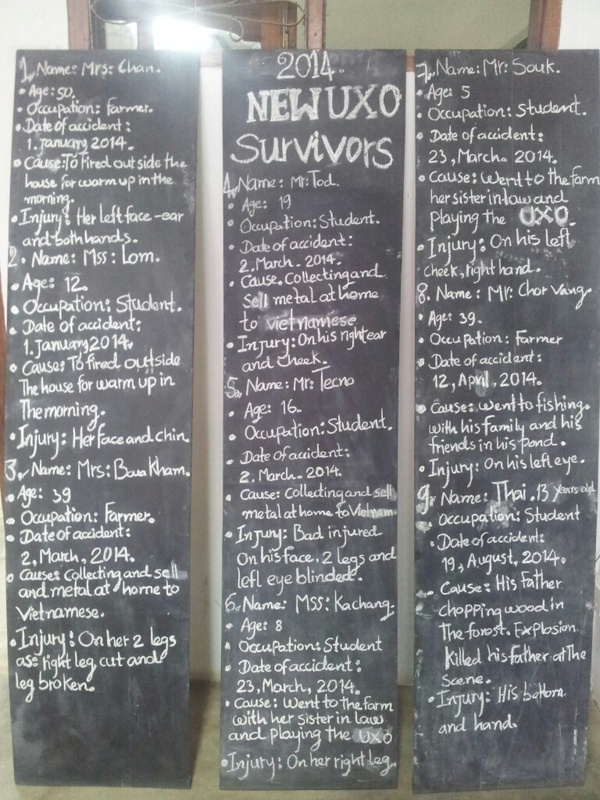 Forty years have passed since the US bombed South East Asia, and people are still being killed or injured. And according to the Cluster Munition Coalition, this is the huge list of countries/areas affected by cluster bombs: Afghanistan, Azerbaijan, Bosnia and Herzegovina, Cambodia, Chad, Chile, Croatia, Democratic Republic of Congo, South Ossetia/Georgia, Germany, Iraq, Lao PDR, Lebanon, Libya, Mauritania, Norway, Chechnya, Serbia, South Sudan, Syria, Tajikistan, Vietnam, Yemen, Kosovo, Nagorno-Karabakh, Western Sahara, Ukraine. [I have added Ukraine to this list due to the 2014 bombardment]. Of this list, the most heavily affected states are Lao PDR and Vietnam, followed by Iraq and Cambodia. Excellent, infornative post. I’ll be skirting through Laos soon but won’t have that much time…don’t think i’ll hitch there…not with my overweight backpack! Great post! Any chance of sharing your Lao hitchhiking letter? Thanks a lot! it’s probably in a box somewhere…but i don’t have it to hand….sorry!